I must admit, I had no idea what sort of response I would receive posting my questionnaire on my Facebook profile, Twitter feed, and a Facebook group, but I did not anticipate receiving as many as 270 completed responses. The amount of data I was able to compile, gives the results more validity, in my opinion. 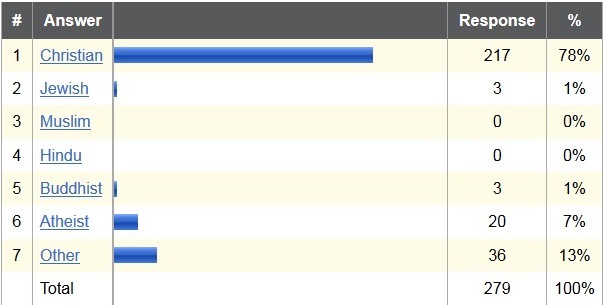 By far the most heavily used social media platform was Facebook. 100% of the respondents said they used it, with the next highest being LinkedIn with 44%, then Pinterest with 42%, and Twitter with %40. This makes sense, since I posted the link to the questionnaire on Facebook. Others that were written in included SnapChat, Yammer, Trello, and YouTube. Most people share content on social media sites More than Once a Day. The demographics were heavily female, 70% to 30% male. And 58% were aged 35-54. After reviewing these numbers, I am second-guessing these age groupings I used from a standard bank of questions on Qualtrics, and probably should’ve broken up this into two groups. 43% of the respondents graduated with a 4-year College Degree, the next highest being those with Master’s Degrees at 18%, with those completing Some College next at 17%. The smallest groups were those with Doctoral Degrees and Less than High School, each being only 1%. The vast majority of those surveyed (89%) share their own photos, videos, and updates. 81% share content from friends, and 61% share content linked from websites. When broken down by religious affiliation, those identifying themselves as Christians dominated the numbers with 78%. The next highest was Other at 13%, 7 of whom wrote in they were Agnostic, and 4 Catholic. Of those who identified themselves as Christian, the highest percentage was Roman Catholic with 21%. The next highest was 17%, saying they don’t attend formal worship. While most of the respondents were Christians, I think these results help show the variety of Christian backgrounds amongst those surveyed. 40% of those surveyed attend worship Once a Week. The next highest was those who said they Never attended formal worship. 61% responded that they share content that expressed their religion on social media. 39% said they did not. Of those who share content expressing their religious beliefs, the fewest respondents share either once a day or more than once a day, and the most respondents shared 2-3 times a month. So that’s a run-down of the basic data. Here’s where it gets interesting. When cross-tabulating the data, you can see some interesting trends. The data shows, as seen in the table above, the more often a person shares content on social media, the more likely they are to share content that expresses their religious beliefs. The data also shows, as seen in the table above, that those having completed less than high school and those having earned professional degrees are the most likely to share content that expresses their religious beliefs. As seen in the table above, the data supports that those aged 25 and under are more likely to share content that expresses their religious beliefs. You can see in the table above the kind of religious content people are sharing by age. 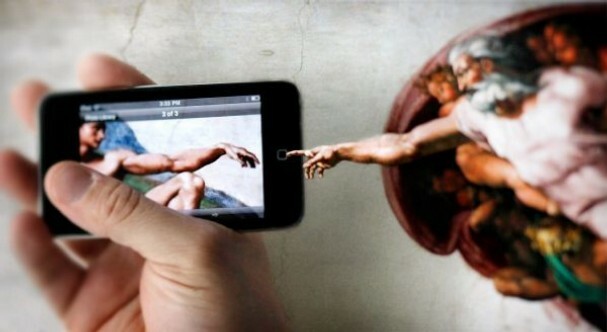 Women are more likely than men to share religious content that expresses their beliefs. Christians are more likely to share content that expresses their religious beliefs than the other religions, having the only positive ratio of 2-1. The results also show that those Christians who identify themselves as Baptist and Anglican are the most likely to share religious content, followed by Evangelicals. 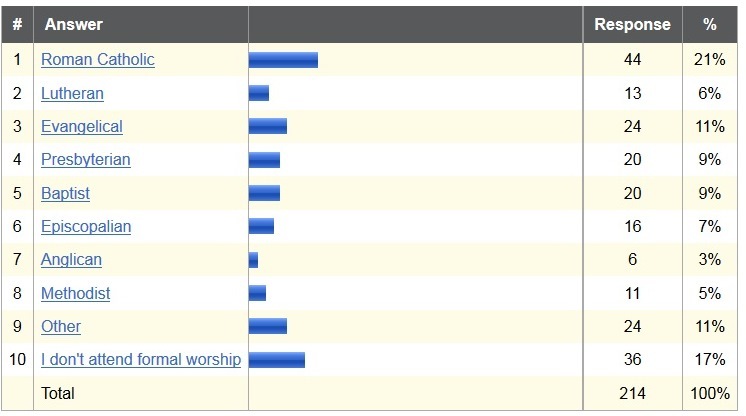 Lastly, attendance at worship has a big impact on people’s willingness to share religious content that expresses their beliefs, as seen in the table above. Those who attend worship at least once a month are significantly more likely to share content on social media that expresses their religious beliefs. If you’d like to take a look at the geographical data in relation to how often a person posts religious content, you can take a look at the table, Frequency of sharing religious content by location. I wasn’t at all surprised that most of the survey’s respondents lived in Florida. What did surprise me was how many from outside of the U.S. responded. Incidentally, I received a negative comment about me generalizing those who “do not reside in the U.S.” inferring that I was a typical American, not seeing others as valid. I must assure everyone, I simply didn’t expect to receive many responses for my little survey, and certainly not any from those living outside the U.S., since most of the people I know live here in Florida. The results were given a snowball effect when four online friends decided to share the link the questionnaire on their own pages. I want to thank everyone who took the time to take the survey. I hope you all enjoyed reading about the results as much as I did. Surveys. There are so many of them! From the U.S. Census, to the random online questionnaire, to the one at the bottom of the receipt in your wallet, it seems someone wants to know our information and opinions about almost everything! Since I’m considering doing some deeper research into how much religion is a part of people’s social media activity, I thought I’d put together a questionnaire using my own Facebook and Twitter accounts to survey my online friends and followers about whether posting about their religious beliefs is a part of their social media habits. 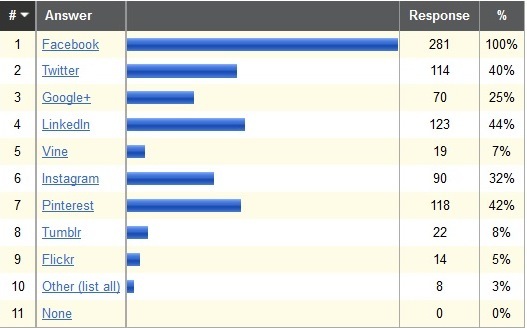 After reviewing a few sites to determine which would best facilitate my questionnaire, I decided to use Qualtrics.com. I liked the format of setting up my survey questions, how it looked visually, and the ease of reading the reports. I started by letting the respondent know that for the purposes of this survey, I’d like them to answer based on their personal use of social media, not any pages they may manage. I thought this was an important distinction to make. The first question was a question to weed-out any respondents who did not meet my criteria — mainly, that they use social media. I used Qualtrics’ “skip logic” feature, so a respondent answering “none” would immediately skip to the end of the survey. 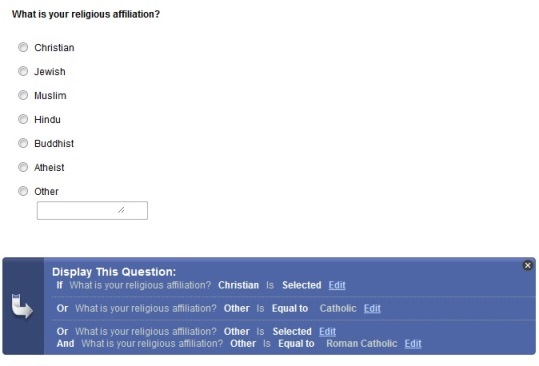 The second question asked about the respondent’s “religious affiliation.” If they answered “Christian” or inputted “Catholic” or “Roman Catholic” (non-case sensitive), they would then be moved to a question looking for more specifics about their denomination, or way they choose to worship in the Christian faith. 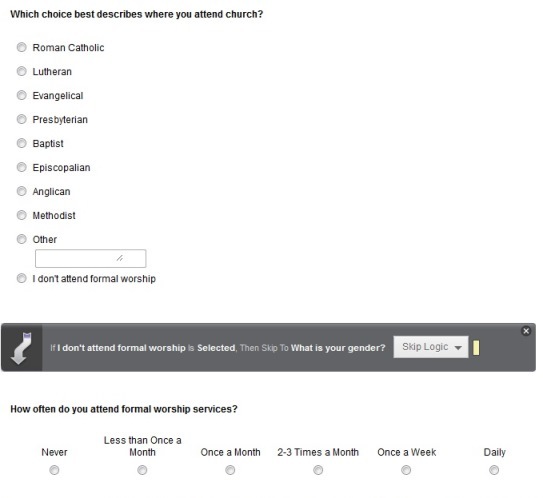 If they chose any other the other answers, it would jump to the next question about how often they attend formal worship services. I then asked several demographic questions about gender, age, level of education, and geographical location. I asked these questions for two reasons: I’d like to know the results, in terms of who is answering my questionnaire, but also to see if there are any links between any of these specific demographics and their occurrences of religious postings to social media, or lack thereof. I then got to the point of my questions asking how often they share content on social media. If they answered “Never,” they’d be immediately moved to the end of the survey. All of the other answers given would give me valuable data to compare to a later question. 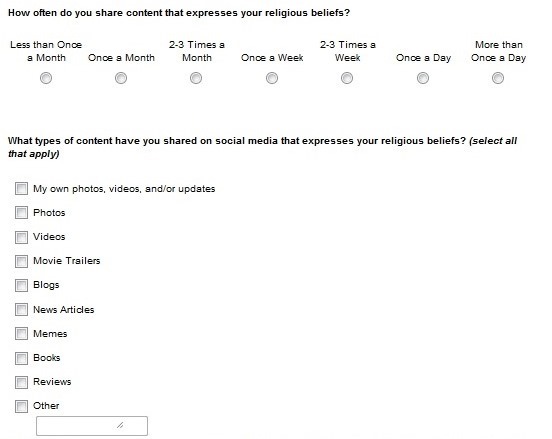 This question was followed with one asking if they share content from “yourself or outside sources that expresses your religious beliefs?” Again, if they answered “No,” they’d be immediately moved to the end of the survey. The final two questions asked about the frequency of the content they share that expresses their religious beliefs, followed by a more specific question about the kinds of content they share that expresses those beliefs. You may find yourself asking, why is this all important? Well, I’ll tell you. According to a 2011 New York Times article, the Jesus Daily Facebook page had more engagement than Justin Bieber, Lady Gaga, or Manchester United. 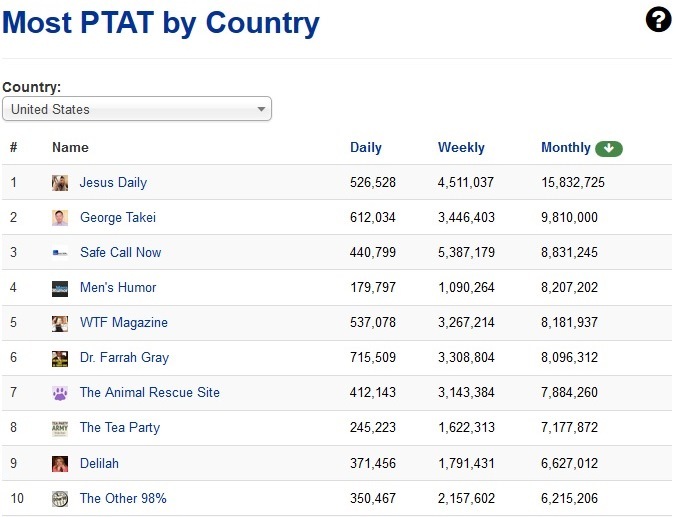 PageDataPro.com shows that Jesus Daily remains in the top spot for PTAT still. 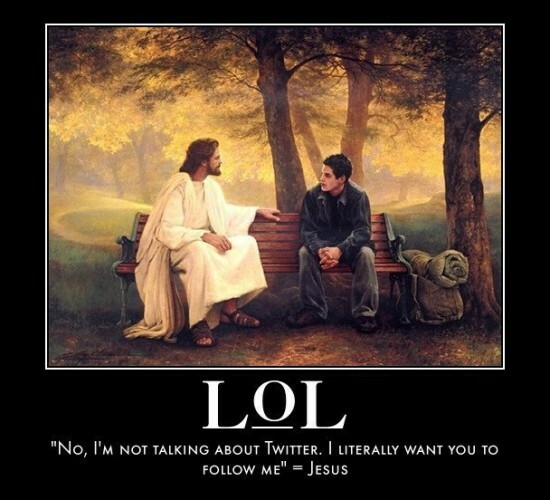 I believe many people of faith are using social media to nurture and express their faith. However, according to a 2013 article which sites a Carnegie Mellon University study, this sort of behavior may be effecting a job candidate’s ability to get hired. 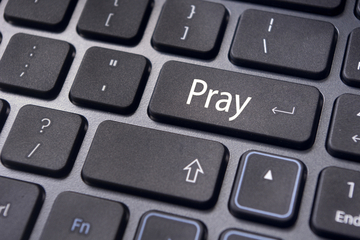 All of the effects of expressing your religious beliefs on social media may be difficult to quantify, but it’s a very interesting topic that I hope to learn more about. 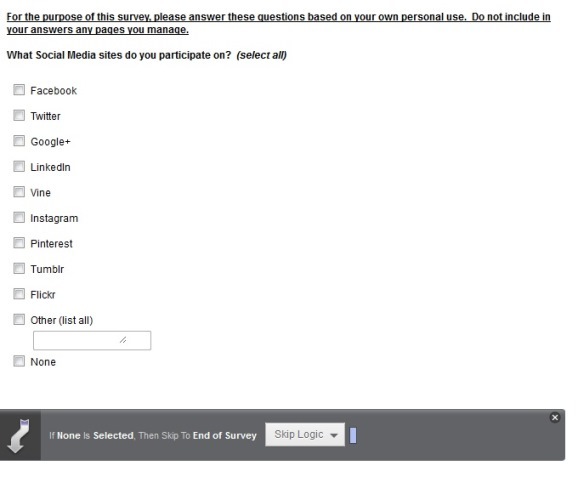 This questionnaire is just one small part in that process. 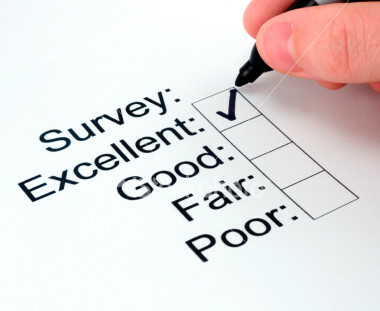 If you’d like to participate in my survey by answering my questionnaire, it will be available HERE through Saturday, February 1, 2014. I’ll be posting about the results next week, so stay tuned!